The main purpose of the JBL PRO NATURE CONCEPT range is to provide a balanced selection of feeds, which meet the nutritional needs of your pond fish in every season. The individual feeds are designed to harmonise in a system oriented to the natural conditions of the particular season, therefore taking the specific physiological nutritional requirements of the fish into consideration. The diagram below shows the individual feeds listed according to the season for which they are designed. JBL Pond Energil is a special feed for low temperatures. The latest research has shown that pond fish require feed, which provides the energy, needed for metabolism even in lower temperatures. This means feeding the fish practically throughout the year with the quantity and composition of ingredients required for the conditions prevailing in each particular season. It is especially important in spring, when the water temperature slowly begins to rise above 4�, to ensure that the fish are fed with just the right quantity and combination of high-energy, low-protein nutrients to meet the needs of the gradually increasing metabolic rate of the fish. If the fish are not fed, the incidence of disease increases significantly. In autumn as the water temperature begins to drop below 15� once more, the fish again require high-energy, easily-digestible feed to build up sufficient reserves for winter. JBL PondEnergil is high in energy in the form of carbohydrates and fats which are exactly balanced to meet the needs of the fish in this season. As fish at this time of the year hardly need any protein for growth, JBL PondEnergil contains little protein in order to reduce the excretion of ammonium resulting from the digestion of proteins. Ammonium would be a serious pollutant otherwise, as the activity rate of the beneficial cleansing bacteria is low in autumn. Since the fish spend their time in the lower regions of the pond once the temperature sinks under 10-15�C, JBL PondEnergil consists of small sticks, which sink in the water and can be given in specific doses. The correct dosage of JBL PondEnergil must be gauged from experience. The lower the temperature of the water, the less the fish will eat. In the warmer seasons when the water temperature rises above 15�C, pond fish require nutritious feed with a great deal of variety to promote healthy growth and breed. A balanced mixture of building blocks (proteins), energy providers (carbohydrates and fats) as well as ballast material (vegetable fibres) is required at this time. A multivitamin complex with stabilised vitamin C improves the fitness of the fish and strengthens their resistance to disease. JBL PondSticks are practically the �bread and butter� in your fishes� diet in this season. Variety is provided by the flake feed JBL PondVario, which contains a high proportion of natural crustacea. 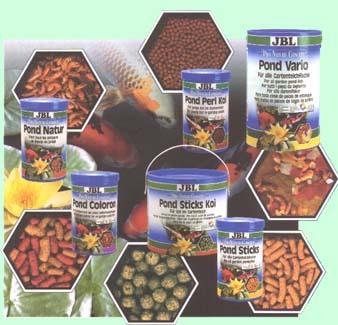 JBL PondColoron Sticks add further variety arid enhance the natural brilliant colouring of your pond fish. 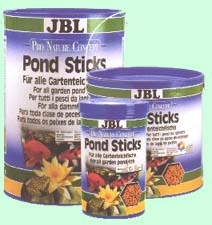 JBL PondPerlsKoi and JBL PondSticksKoi provide a balanced selection of feed specially designed to meet the specific needs of the �kings� of the garden pond. A high protein content as well as wheatgerm and spirulina promote the healthy growth and brilliant colouring of these fish. Young, growing koi are best fed on JBL PondPerlsKoi, a feed specially designed to appeal to smaller koi. JBL PondSticksKoi is a feed, which meets the requirements of older fish, with their larger mouths.